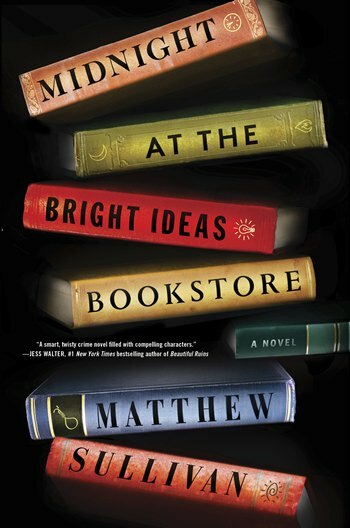 Matthew Sullivan’s “Midnight at the Bright Ideas Bookstore” is shocking, charming and thrilling from the opening scene. Lydia Smith, a compassionate bookstore clerk, is horrified one night when she finds her favorite customer, the young Joey Molina, has committed suicide in the Western history section. Things turn eerier when Lydia spies a picture of herself as a child poking out of the dead man’s pocket. However, it is when Lydia learns that Joey has left all of his meager possessions to her (including an assortment of books he has meticulously defaced in efforts to convey a message of sorts) that the bookseller has a mystery on her hands. While she attempts to decipher Joey’s message, readers will begin to wonder what Lydia is hiding. She brushes off a postcard from a homicide detective who recognized her photo in the newspaper; she’d rather not think about a villain dubbed the Hammerman lurking in her childhood (and possibly the streets today); and she refuses to speak to her father. The story alternates between present day and Lydia’s childhood, and Sullivan navigates the transitions elegantly. The narrative remains consistently suspenseful, yet smooth. With compelling characters and rich descriptions, Sullivan’s writing is spot-on. Raj, a chubby, jumpsuit-sporting boy befriends Lydia as a child and offers her doughnuts from his parents’ gas station. David, Lydia’s boyfriend, with his mangled fingers resembling a knot of bread dough in his palm, disassembles VCRs and wipes crumbs from the kitchen counter. BookFrogs, a cast of local eccentrics who regularly fill the bookstore, roam Bright Ideas’ aisles and nap in armchairs.